Natrunsfar: Marathons, Ultras, Ironmans...She rocks it all! 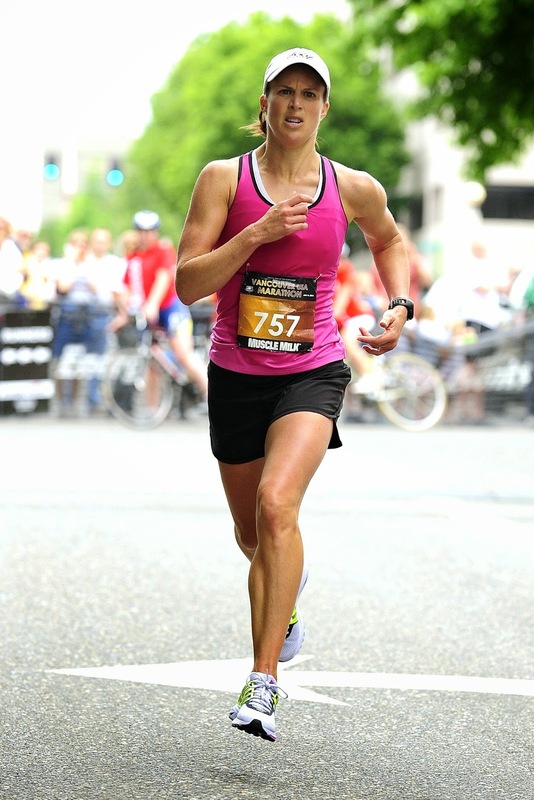 Marathons, Ultras, Ironmans...She rocks it all! When I first met my friend Jen, she recently had a baby and I had zero children. We were introduced by a mutual friend (also a runner!) and Jen joined our book club. I immediately knew that Jen and I were going to be friends, because she had a serious love of running and she was such a genuine, fun, wonderful person. When I was pregnant with my first baby, she was right there to celebrate and such a loving, supportive friend. When I was pregnant with my second baby, I was put on mandatory bed rest for 2 MONTHS. At that point, Jen had three young children of her own. Not only did she bring all three of her kiddos to my house so she could take Josh to the park to play, she also brought me an incredibly healthy dinner. Cause runners are the best friends, right?! We had our final babies within two months of each other (my second, her fourth) and then... Jen and her family moved away. To Oregon. Jen, her awesome husband and 4 great kiddos!! Our book club friends and I were all so, so sad to see our friend move away, but I also thought to myself: "How perfect that she is moving to the running mecca of the US!" For long distance runners, Oregon is pretty special. Perfect running weather, stunning trails, world class athletes and Nike in your backyard. What more could you ask for? Four and a half years later, we are both entrenched in super busy lives, but have managed to keep in touch. It was the absolute highlight of my weekend to talk and catch up with Jen for a (mostly) uninterrupted two hour chat all about running. You see, Jen is a FANTASTIC runner. She inspires me and I know she'll inspire you and that is why I am so excited to feature Jen on the blog today!! 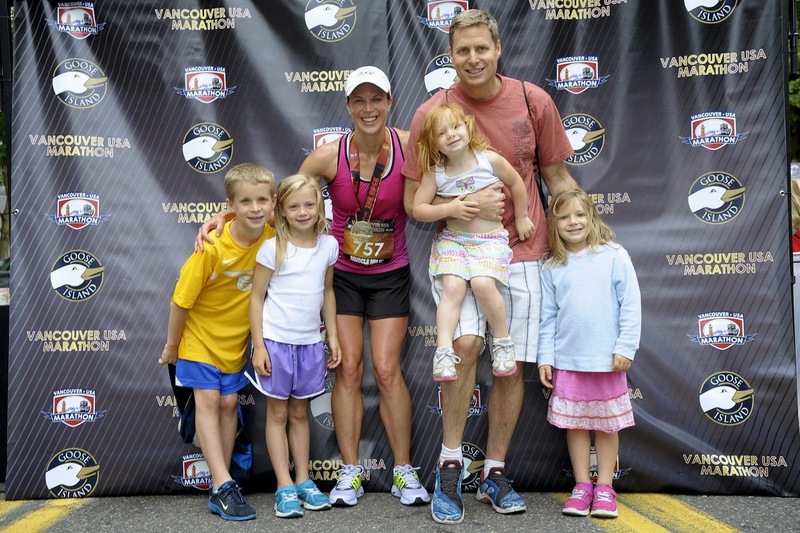 Jen has four young children, but doesn't let her crazy busy life get in the way of being a great runner. Jen's parents were runners while she was growing up and she ran her first 10K when she was 12 years old. She also ran track in junior high and high school while swimming year round. Jen ran her Freshman and Sophomore year in high school and then sprained her ankle Junior year and the injury didn't allow her to run a important meet that year. She decided at that point to focus on swimming and went on to swim and study at Northwestern University. After college, she decided to run her first marathon. Huge moment - the start of something big! Jen's parents had run the Chicago marathon while she was in college and that was the race she decided to run as her debut. 3:36 was her time and just like that, there was the BQ as well! April of 1995 was the 100th anniversary of the Boston Marathon AND it fell on her 23rd birthday!! How perfect is that? A pretty perfect way to run your first Boston. From that point on, Jen would run one or two marathons per year and she would go on to run Boston again. Jen would be extremely prepared to run Boston this time - she was living in the city and attending Harvard University as an MBA student (did I mention, she is super smart too!). This meant she had lots of experience running the course, studying it and having a solid plan of attack. Her training consisted of following the Runner's World marathon schedule, but she knew this time to start conservatively and that a negative split was her friend. Her time would be 3:42 at Boston and for four more years she would hold on to her 3:36 PR. Jen would finally break her PR in Portland. She graduated from Harvard and moved to Portland to work for Nike (!) in the strategic planning group. Nike turned out to the perfect place for a runner to work, (runs at lunch, biking to work!) and she met a group of guys that she started training with. They were all faster than she was, but she kept at it and trained for the Portland Marathon, which she ran in 3:28 - a new PR! 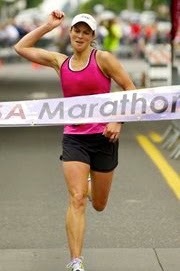 Jen would run the Portland Marathon year after year and ran another PR of 3:24. I'd like to go back to Jen's swimming for just a moment. Jen started sprinkling some triathlons into her life and soon had sprint triathlons, olympic distance and a Half Ironman under her belt. She decided to take the leap and train for her first Ironman (Canada)! As with everything she does, Jen put her heart and soul into training and went on to be the 3rd woman out of the water, felt solid on the bike and even though her marathon time was not as strong as she wanted (4:10 marathon - the last 10 miles were tough!) she went on to finish in an incredible time of 10:50!! Jen's running kept evolving and at this point she was married, and a homeowner living in Southern California. The babies started coming and now she has four beautiful children ages 5, 7, 8 and 10 1/2. It would be when her family of six moved back to Oregon in 2010 that she would really break some barriers. She started training with a group of fast women - suddenly there were super fast runners everywhere! Down the street, next door...Oregon was booming with fast mother runners. In 2011, Jen started training to run a sub three hour marathon. It would take her two years to put together a full, successful training schedule. 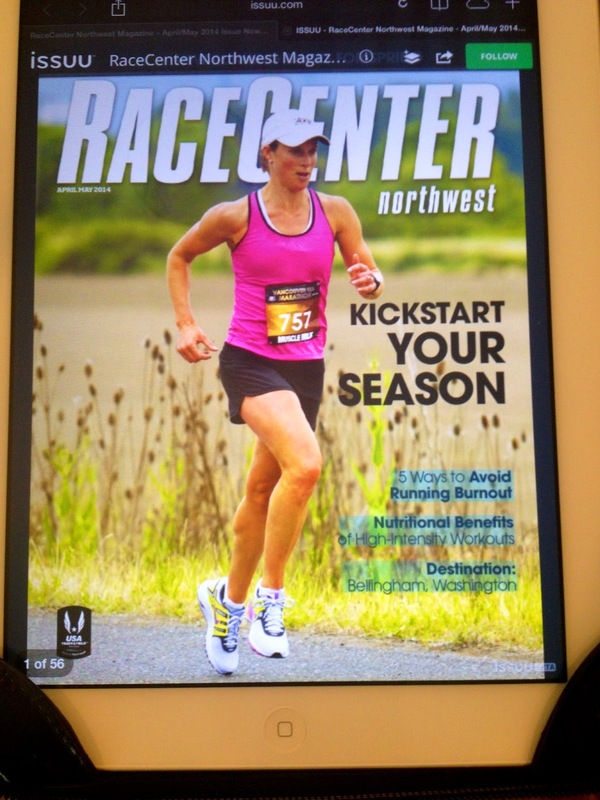 Jen on a running magazine cover! What does a sub three hour training schedule look like? Tempo runs, track work, (example: 800 meters with a 200 meter recovery or 6 x 1,000 meters at 200 recovery. Notice not much recovery in between.) marathon pace runs (two in a week), progression runs (20 miles with 12 at marathon pace) and lots of hills incorporated into her training runs. With all of this specific work, plus logging a lot of weekly miles, Jen decided to run her first 50K ultra in 2011. She ended up winning the women's race in 5:54!! The first 20 miles were great and the last 10 miles were very crazy and technical - crossing huge rocks and tons of rocky downhill. But, she kept pushing and finished strong. Now she would add 50k winner to her growing list of accomplishments! The intense training and winning the ultra - all of this hard work would culminate into Jen winning her first marathon ever and her first sub 3 hour at the Vancouver USA marathon in 2013! Winning time? 2:58!! The look of a champion about to win a marathon! This past fall, Jen ran the NYC marathon and was invited to run in the elite section of the race!! Jen was also celebrating her 25th overall marathon, which is also very, very exciting. Hard work pays off, because even though it was a cold and super windy day, Jen would finish NYC as the 57th overall woman to cross the line in 3:01:37!!! -This winter for the first time, Jen hired a coach ! Jen said she loves working with her coach, because she loves the variety of workouts, her coach has a vested interest in her training, and it helps to keep her accountable. - Jen has incorporated a lot of extras into her running, including running a one mile warm up and then performing an 8 minute dynamic stretching routine. She does this every day before starting her run. - Jen goes to a Chiropractor for active release. - For the first time she got a professional running analysis done and realized she was striking more with her mid foot, instead of her fore foot. She is working hard to correct that. -She runs 6 days and will swim on the 7th day. -Any run over 10 miles, Jen will take in water with Cytomax for hydration. -She goes to bed by 9:30/10 PM every night to get lots of good sleep. -Flexibility: Most runners run their long runs on the weekend. This is tough for Jen to do because of her family's busy sports schedule, so she runs long on MONDAY. Monday, Wednesday, Friday are her hard days and Tuesday/Thursday are recovery days. Saturday and Sunday are moderate days. She does what works best for her family's schedule. At the end of the day, her family is most important! Jen winning her first marathon! What kind of gear does a sub 3 hour marathoner use? - The very basic Garmin Forerunner 10, which she only uses if she is training for a race. Mostly, she likes to run by feel. - Jen runs in the Mizuno Wave Inspire running shoe. - Balega Ultra light sock is her favorite. - The Wondergirl tank from Skirt Sports (she loves the cleavage alley feature!) is her must have running top. - Training for a half marathon in July. Time goal: 1:22. - Fast half marathon in October. - Racing the CIM marathon in December. A goal: 2:52, B goal: 2:55, C goal: PR, which would mean under 2:58. What does Jen eat before a race? Jen read this book and was inspired to become Vegan! - The night before a race, Jen will eat a small salad and brown rice pasta. - The morning of she'll drink UCAN, which is her new race nutrition! - For the NYC marathon (a later starting 9:30 am race), Jen had toast with almond butter at 5am, a protein power smoothie with banana at 7/7:30 am and a serving of UCAN at 8:30 am. - For Jen, it is about the journey much more than the race goal! - Running gives her a sense of accomplishment and the numbers on the clock are merely a pat on the back. Jen is also featured in THIS very popular book in the running world. It talks about Jen winning her first marathon - be sure and check it out!! A huge thank you to Jen for talking with me all about her running!! Jen, you are such an inspiration and proof that one can do anything if you put your mind to it!! What is your go-to race nutrition? I used Fluid Performance drink during my last marathon. How many marathons have you run so far?